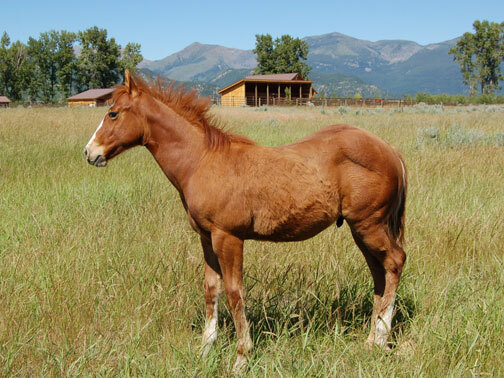 Cash was born on a Quarter Horse breeding farm in northern Alabama on February 7, 2007. The couple who run the farm contacted us when Cash was just 4 days old, after they realized he was blind. Cash has a very rare eye disorder called aniridia, in which the irises don’t develop. The couple felt they could not keep the foal, and believed their only option was to euthanize him if we couldn’t help. And Cash needed to be gone from the farm within a month. 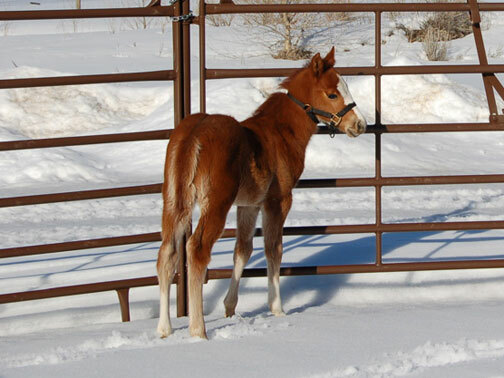 We are always very reluctant to take a foal away from the mare at such an early age — normal weaning is at 4 to 6 months. But as our vets tell us?if the foal is healthy and vigorous and has a zest for life?and if the alternative is euthanasia’then it’s a risk worth taking. We’ve had to do it before, with blind Destiny who came from South Carolina when she was only 4 weeks old. With a contribution from the breeder and his wife, and a gift from a generous supporter in British Columbia, we were able to afford the cost of shipping Cash all the way to Montana. So we held our breath as Cash made his big trip across the country. 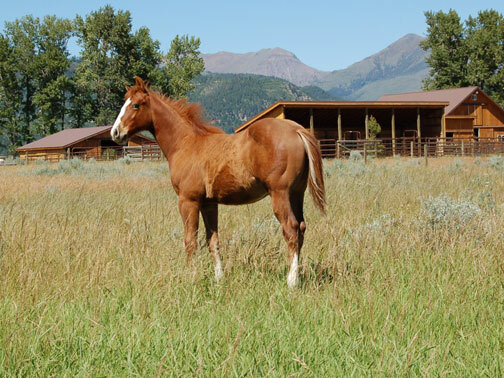 He received excellent care from the folks at Bob Hubbard Horse Transportation. They were understandably nervous at first about transporting such a young foal without its momma, but after we explained the circumstances and assured them we understood the risks involved, they got behind this adventure in a big way. Thus Cash arrived here on a snowy March night at 4 weeks of age. He immediately impressed us with his calm, easy-going nature. We could tell he’s one smart little boy, and he quickly figured out his environment and started mapping his boundaries right away. You can see him really thinking when he encounters something he’s not sure about. The arrival of a blind baby like Cash helps keep the “cycle of life” going for us. Having just lost our beloved old German Shepherd Pappy the week before Cash came, it seemed fitting that a little disabled youngster would arrive a few days later, full of life and energy and ready to be loved. Cash is now a healthy, happy 5-month old who’s developed into a real character. He seems to know he’s incredibly cute, and yes, he’s quite full of himself. Whether he’s opening the zipper on our jackets or sliding under corral fences to eat grass while lying down, he’s full of antics. To see Cash in action, go to www.youtube.com/rollingdogranch and watch our videos of him there.